Congratulations to County Executive elect George Latimer on his election victory. We are confident that Latimer will work to adjust the county’s policies at the airport to respect the environment and the airport’s neighbors. 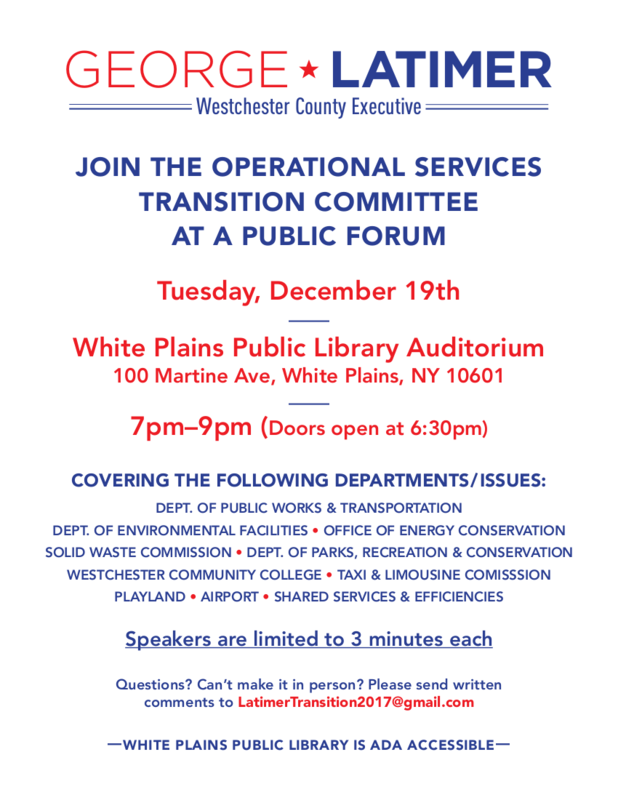 In an effort to bring transparency & openness to Westchester County’s government, Latimer has appointed several all-volunteer transition committees to listen to residents’ ideas and priorities for county policy. CRCA Executive Director Jonathan Wang is serving as co-chair of the Operational Services committee. This committee covers many of the infrastructure services delivered by the county, including the airport. 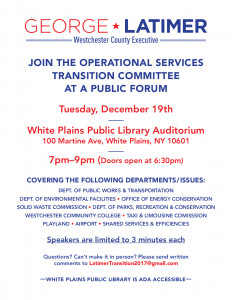 The committee is inviting the public to attend its public hearing on December 19 from 7pm – 9pm at the White Plains Library, 100 Martine Ave. We encourage residents to come make their ideas heard in this experiment in participatory government. Encouraging to see that County Exec Elect , Latimer is taking steps to solicit citizen involvement & transparency in local government. Hope to attend the meeting on 12/19. Sorry I couldn’t be there but glad that there will be more transparency in county govt. The voters have spoken. Thank you Mr. Latimer for listening. We are confident you will preserve the quality of life for airport neighbors and all residents of the county. There are lots of ways to make Winchester financially more sound besides turning Winchester County Airport into LaGuardia North. Your low and slow tax increase plan sounds much more responsible and need not rely on increasing airport noise to fill the county budget gap. A few dollars more from every resident is worth the much better quality of all Winchester residents. All residents will benefit from reduced traffic, noise, air and water pollution etc.